This is a very basic salad with no hard and fast measurements, but the next in the summer salads series nonetheless. I'm sharing this because it's a good thing to make to cultivate your taste method of creating good food. Too many people are out there cooking and not tasting as they go. Adding a bunch of crap at the end isn't going to save something. Taste as you go so when you arrive at the end, the dish is to your liking. Boil macaroni in salted water according to directions. Drain and store covered in fridge for at least two hours, but overnight is okay. When you're ready to assemble the salad, put the macaroni in a large bowl with room to move and mix. Add your veggies, crab, and shrimp, then start by adding a cup of mayo and a tablespoon of each mustard. Then the spices - I'd start with about 1/2 tsp of each. Mix well, then taste it. What do you want to taste more of? I typically add more mayo - nothing worse than a dry salad, and let's be honest, macaroni salad is not the place to cut calories - and spices, but not all the spices. I do it by taste, and so should you. It's a great easy salad to bring to a party or to make on Sunday for the week as a side. 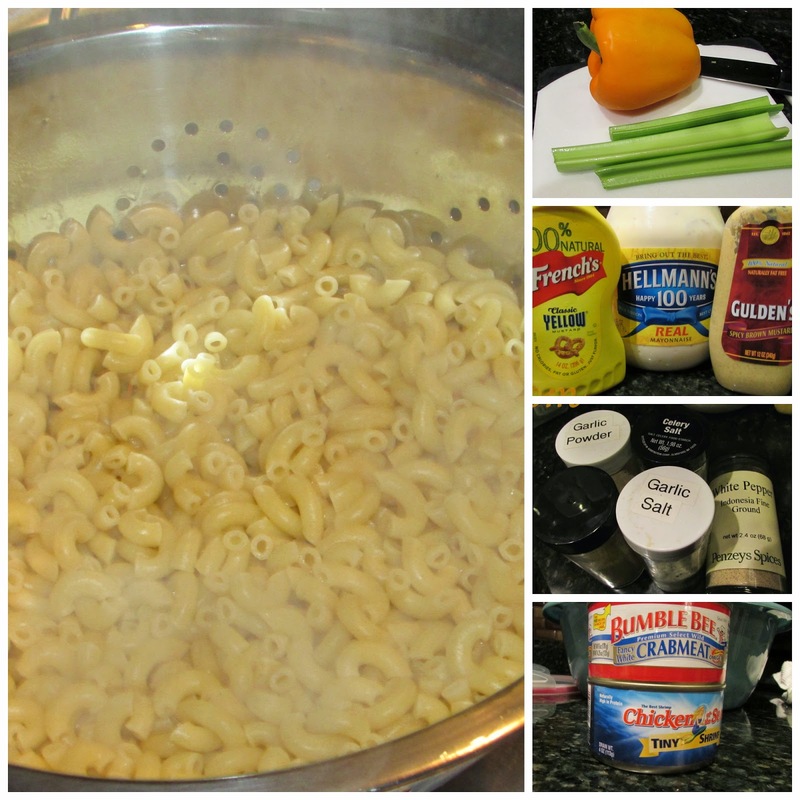 What do you put in your macaroni salad? I love a good macaroni salad (when Im not dieting). So tasty! Macaroni salad is an indulgence for me so it has to be good. Tasting as you go is so important. I am a Cain's girl, sorry Hellman's see the curb you've been kicked. ohh heck yes. i love a good pasta salad. probably up there on some of my favorite foods. gotta try this! Looks good! I like the addition of crab and shrimp. Haven't tried anything like it but looks perfect to serve at a BBQ/summer party. Thanks for linking up! This looks AMAZEBALLS!! I make a pretty mean pasta salad with a mayo, sour cream, vinegar, mustard, sugar mixture. But I'm definitely going to be trying this out!! I haven't had macaroni salad since last summer...mmmmmm. Yours looks good! I have never made it on my own before because the last thing I need is it sitting around the house for me to eat in large servings. My mom and sister (recipe got passed on) make the best I have ever had! I am not sure what all is in it but I know macaroni (er der), mayo, egg, celery, onion, and paprika. Not sure what else. I think you inspired me to finally ask for the recipe! I hate mayo, so I have zero preference. I just know whatever I usually get makes my husband mad because it is the wrong one haha! mmmm this sounds delish. i agree, if you're making something like this, its not the place to cut calories because then it wont taste as good! I love macaroni salad, but have never used spicy brown mustard or peppers. I think Jason would like this combo! to add more Hellmann's before serving. YUM love summery pasta salads and this looks delish! Mac salad WITH crab and/or shrimp??!! I. must. have. now. That looks so good - and since it is still hot I just love having a cold dish whether it is the main dish or a side dish. I just love keeping the kitchen cool. Thanks for sharing. Ooo yum. I love macaroni salad. And potato salad. Mmm. My go-to, classic Mac salad has tuna, celery, mayo, and lemon juice, but I do a pizza version with a tomato paste-based vinaigrette and a bunch of yummy stuff like peppers and pepperoni.